Click here to access our convenient Online Service Request Form. Facility Automation is a full service commercial and industrial automatic control, security, surveillance, and fire alarm system company. Our services include everything from site energy savings audits to complete turn-key project design, installation and service. 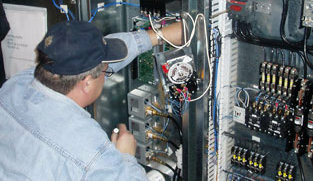 We have a factory trained experienced personnel that can calibrate and troubleshoot existing controls systems including DDC systems, electronic controls and pneumatic controls systems. Our special systems division can provide technical support and service for fire alarm systems, nurse call systems, intercom and paging systems. It's all about you. Your equipment. Your business. Your Life!